If some of you think that it's possible to show pretty much anything in these sorts of graphs, then you're wrong. For instance, it's not possible to swap West_Siberia_N for Sintashta, because the highest Z score usually blows out from almost nothing to well over five. And it's not possible to push Sintashta-related ancestry into Dravidian-speakers from South India. But if you think it is, then, by all means, have a go. The graph file is here. I have a strong suspicion that the Sarazm Eneolithic has some South Asian admixture. 1. 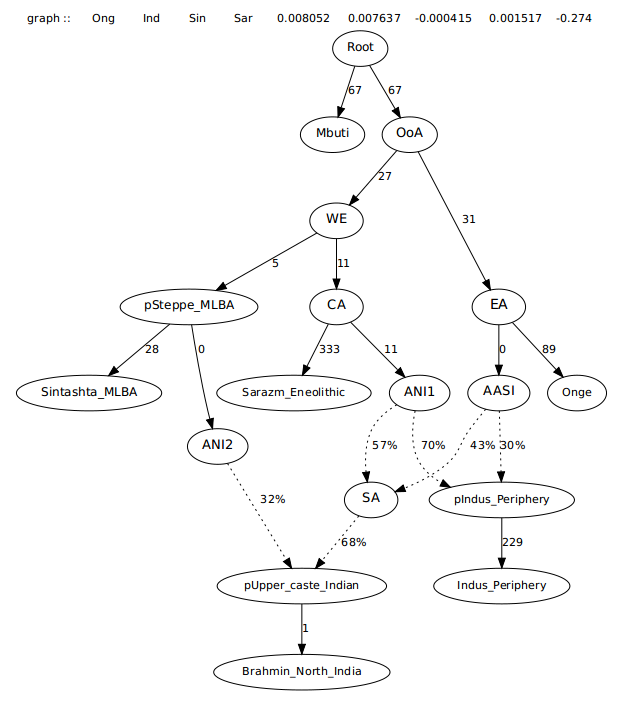 In the allele sharing graph of figure S3.10, the Sarazm sample is shown to have significantly greater allele sharing with the Austroasiatic Birhor than even the main BMAC cluster comprising of Gonur1_BA, Dzharkutan1_BA, Bustan_BA & Sappali_Tepe_BA who are known to have around 5 % AASI. 2. In the admixture graph, the Sarazm samples clearly show the AASI yellow component quite unlike other Copper Age Turan samples. 3. In the proximal models for the Indus_P and the Swat Iron Age samples, the Sarazm EN most consistently comes across as a heavy admixture source. The authors also could not get an accurate proximal qpAdm model for Sarazm EN. Perhaps using an AASI heavy source could do the trick. Is the Dravidian population being used a tribal group? Seems very AASI rich. Also curious about the extra ANE in south asians, how much do the AASI rich paniya, bhumij etc. have? Is the Dravidian population being used a tribal group? Seems very AASI rich. Gond from South Central India and Malayan from Southwest India. Both Dravidian-speaking groups. The latter maybe tribal, not sure. Sarazm_Eneolithic has some Botai and/or Kelteminar ancestry, so it probably has a bit of Siberian admixture as a result. But overall it's very similar to the West Eurasian part of Indus_Periphery, and, hence, the non-steppe West Eurasian part of present-day South Asians. That's probably why the models work. 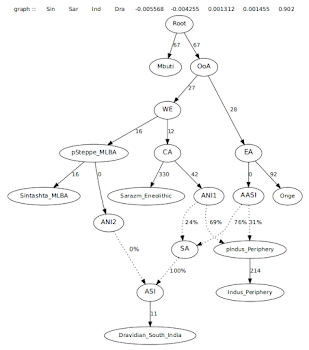 If I start fiddling around trying to show AASI admixture in Sarazm, they'll probably fail. Do you have a model for South Indian Brahmins? The South Indian Brahmins that I've got don't have enough markers for this. I've got my FtDNA autosomal results. Would they have enough markers? Nope, not for this. I need around a mil Affx/rs markers. Argh! Any studies that would accept samples and provide that many markers? I'd love to get some studies done on my population. Looking at a mao, Sarazm valley is very close to the Ferghana valley (300kms). Steppe_MLBA came via Fergana. Maybe there was a direct mix of pSteppe_MLBA and sarazm_eneolithic to form ANI. We wouldn't need ANI1 and ANI2 in that case would we? I think these would be very interesting, whether proof or disproof. Thanks for your blog, endlessly interesting. I settled on taking ~18.7% of SISBA3 that was not like SISBA2, because some SISBA2 kept coming out in the resulting component, so I kept removing it. Onge component still has like half West Eurasian in it. AA is the 18.7% of SISBA3 that was almost purely non West Eurasian. So, Onge in this Global25 on its own is probably a fine "ASI" substitute, even if the distances are increased by using it over a closer Austroasiatic tribal group. 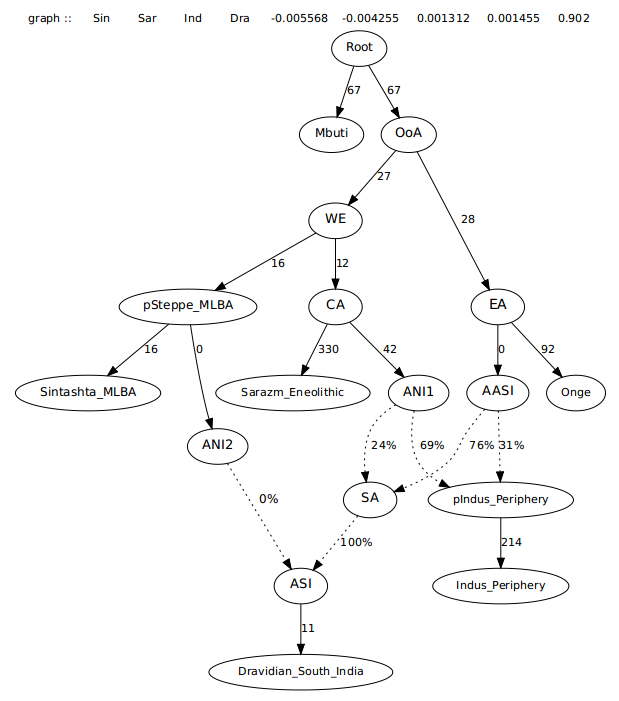 "I feel that the preprint is really missing a very simple, systematic qpGraph analysis like this"
These are surprisingly clear. Very solid output. "Looking at a mao, Sarazm valley is very close to the Ferghana valley (300kms). Steppe_MLBA came via Fergana. Maybe there was a direct mix of pSteppe_MLBA and sarazm_eneolithic to form ANI. We wouldn't need ANI1 and ANI2 in that case would we?" For whatever it's worth, with Global_25/nMonte, South Central Asians actually prefer Turan-admixed Steppe_MLBA to plain Steppe_MLBA and Steppe_MLBA_East. Samples like Dashti_Kozy_BA. They'll show Dashti_Kozy_BA + Scythian. Have yet to include Dashti_Kozy in South Asian models, but if they too prefer it to Kashkarchi_BA, it would indicate that the Steppe_MLBA-related infusion into South Asia came via a population with heavy BMAC-related admixture. But again, I haven't tried South Asian models yet (with the Turan-admixed samples). Yes, Sarazm_Eneolithic is the best proxy yet for non-steppe-related West Eurasian ancestry in South Asia. Honestly though, Shahr_I_Sokhta_BA2 would be the best, since it's basically West Eurasian (10%-20% AASI, probably 15%). 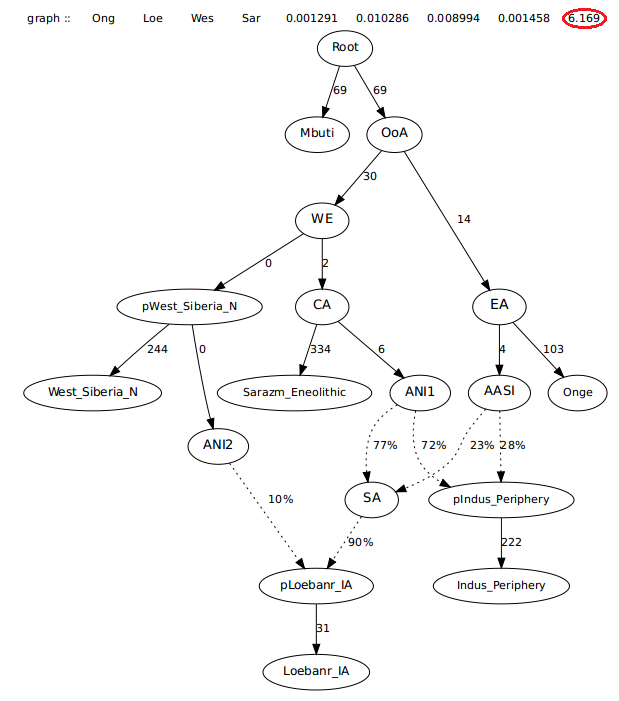 It might be worthwhile to create a simulation based on Shahr_I_Sokhta_BA2, minus the 15% AASI. You see that Rob? My nMonte numbers for Swat Valley were right. Davidski, can you make a qpGraph with Uttar Pradesh scheduled caste (or similar) to compare to the North_Indian Brahmin, who if I remember correctly are from that region(?). BTW nice simple graphs, they really highlight whats going on. It was me who tried to explain you why your model was wrong. I thought you understood it, but if you didn't or just want to stick to your opinion without arguments, that's ok. But at least address to me now if you want to discuss it (not that I want, to be honest) and stop with this silly obsession with Rob. You've already been warned about it and it's tiring for everyone here. I think ANI2 is compensating for the relative lack of ANF-related ancestry in ANI1 here since Sarazm is being used and not Gonur. While it's not possible to entirely swap Sintashta out for West_Siberia (there is a non-trivial amount of steppe_MLBA in those samples), some of ANI2 could correspond to this kind of ancestry. Alberto, Rob also argued against me. The actual paper gives a similar estimate for Steppe MLBA east admixture in Swat Valley as these qpGraphs and the model I was working with. "It was me who tried to explain you why your model was wrong." Obviously, it wasn't wrong. The high Siberia HG & low Steppe MLBA thing you and Rob pushed for isn't panning out in qpGraph. Davidski: it's not possible to swap West_Siberia_N for Sintashta... But if you think it is, then, by all means, have a go. (I'm interested here in whether the constraint of having Sarazm_E mix with AASI constrains the amount of Sarazm related ancestry proportions relative to West_Siberia_N in a way that stops the models from working, so this is an alternate topology. You don't know until you try. But no, that's a negative; using Gonur actually increases the Sintashta-related ancestry, and also the highest Z scores. So these models aren't an improvement on mine. Doesn't work, probably because the model is missing the EEF/WHG input from Steppe_MLBA. As per my comment to Anthro Survey, using BMAC (Gonur) with Sintashta does work, but things start to get wobbly. Taking out Sintashta and replacing it with West_Siberia_N is a disaster. However, using Hajji_Firuz_BA alongside Gonur works rather well. But this isn't surprising, considering that Hajji_Firuz_BA has a lot of steppe ancestry, and approaches some Steppe_MLBA samples in this respect. But, of course, if the Indus_Periphery samples are indeed what South Asians were like before steppe-related expansions into the region, then this model isn't more parsimonious than mine. Thanks for trying! Interesting. Didn't see at first that Gonur had a deficiency in West_Siberia-related rel to Sarazm, so maybe this nullified the benefit of using it in that run. Or maybe Gonur+Steppe_MLBA is somehow inflexible w/regard to realistically dishing out basal ancestry (CHG/Iran-like vs ANF). HF_BA is ~50% steppe, or equivalent thereof. So, the model is roughly in line with what people have been getting w/Monte. We can't know what the pre-steppe people of Swat were like, but increased ANF wouldn't suprise given interfacial geography. They look to have non-negligible and balanced proportions of West_Sib and ANF. Ofc, I've also given steppe_MLBA_east(w/varying % of extra Iran_N and Sib) some thought(though no sample in particular), but can you try these first? "Alberto, Rob also argued against me"
"The high Siberia HG & low Steppe MLBA thing you and Rob pushed for isn't panning out in qpGraph." Sam, you need to stop speaking on other people's behalf, esp. when you don't grasp what they're saying. Some people correctly predicted "Siberian HG" (in reality a central Asian forager) presence in SCA, and that's been confirmed. Nobody suggested there won't also be Steppe MBA in post BMAC phase. I stand by my own estimates of 0-15% Sintashta ancestry in Swat. Note that David's model are a 'or' scenario, not 'and'. Very interesting, thanks so much! I think it's very informative that the WSibN (I really need to stop calling it HG) just doesn't work. Yeah, I would expect that 1/2-steppe HF_BA sample to work similarly. "Some people correctly predicted "Siberian HG" (in reality a central Asian forager) presence in SCA, and that's been confirmed. " Yes, SC Asia has excess ANE ancestry but not the amount your models give them. Your models inflate their excess ANE which reduces their Steppe ancestry percentages to unrealistically low numbers like 5-10%. qpADM can differentiate between excess ANE & Steppe well unlike G25. qpADM is saying the high amounts of excess ANE in your models is wrong. I was right you were wrong. "Sam, you need to stop speaking on other people's behalf, esp. when you don't grasp what they're saying. " I understand what you've been saying. Most of your nMonte scores especially for Myceneans or Swat Valley are a seris of pathetic attempts to deny the inevitable: Consensus that the PIE homeland is the European Steppe. You're wrong about the Myceneans, you're wrong about Swat Valley. Yes, the Myceneans got their Steppe ancesstry (which you estimate at 7%) from trading partners further north in Balkans not spread of IE(s) from Steppe. Um. Nobody should trust anything you say about what's wrong with the Kurgan hypothesis or Steppe ancestry percentages when you say garbage like this. Rob, if only you could understand the mtDNA data like I do. When I saw, the mtDNA links between Asia & Andronovo-complex I was sold on the origins of Indo Iranian languages. qpGraph I think provides the clearest illustration for what really went down. Thanks Davidksi and others for running these, and of course Nick Patterson for writing the software! Also, does anyone know if the genomes from last year's Canaanite study were released, or are planning to be released? I guess they're nearly identical to the previous samples from Jordan but still would be nice to have. (Sorry for asking about such an old study... been out of the game for a while and don't see them in Davidski's data). "“10-20% MLBA admixture Overal, demographically negligible ; and no signs of elite conquest scenario So probably just assimilated andronovo traders and females Very unlikely steppe spread PIE. The component of MBA steppe ancestry is < 20% and no R1a link. And I'm not automatically suggesting IA did not spread via the steppe, but do like to suggest the possibility, enjoying the anticipatory steppe fan girl theatrics. LOL Sam you're never right. I suppose you think you know more than Kurd, too. The paper's qpAdm shows no WHG & EEF. Clearly, its highly dependent on the modeller and populations used. "Yes, the Myceneans got their Steppe ancesstry (which you estimate at 7%) from trading partners further north in Balkans not spread of IE(s) from Steppe. "I understand what you've been saying. Most of your nMonte scores especially for Myceneans or Swat Valley are a seris of pathetic attempts to deny the inevitable: "
"Numerous people have pointed out to you that you don’t have a clue what you’re taking about - no matter the subject matter"
Lol. I admit I often talk with authority I don't have which does have something to do with "everyone is special" mentality in America. But, I'm rarely way off the mark. For example the debate I had with Ryu. His theory that early uralic(s) were mostly Andronovo and modern Siberian Turks mostly Scythian is definitely wrong. He was way off the mark in that instance and I'm confident I'm right. You might have to start paying attention to that 42% Iranian admixture. It has 13.2% Steppe_MLBA admixture. So they are very wrong models. I can't understand how after being around for years and using 4mix/nMonte for years you still don't care to test for obvious flaws. And even when explained to you, you stick to them? I'll move on now with this. Just found this picture about proportions of EEF-WHG-ANE in europe. The ANE component is the one associated to the so called "steppe invaders" ( yamnaia component)right? According to this figure we have more EEF in Andronovo that ANE in central-western europe! To trigger a language change it seems to me ANE should be much much higher overall europe. Do you plan to create new D-stat spreadsheets with the new genomes? @Davidski: Worst stat f4(Onge,Loebarr;West_Siberian,Sarazm) comes out as higher than reality, yeah, which models that the non-Onge part of Loebanr (ANI3) must be further from Sarazm relative to West_Siberian in some way that the model can't achieve by making it a mix of Sarazm and West_Siberian related streams with more substantial West_Siberian which somehow this would break the model in other ways (can't really know without seeing the full output). It would also be interesting to see how Armenia_MLBA in place of West_Siberia_N also breaks the model (even though it's not really historically plausible or anything). Chalcolithic east Iran & central Asia had significant ANE ancestry. Several have 20% ANE admixture. If a Steppe source is included in the model they'll score some Steppe. This doesn't show some great flaw in my models but just demonstrates the shared ANE ancestry between them and Steppe. The problem with yours and Rob's model is you include irrelevant ANE-rich sources when modeling Swat Valley. Gonur1_BA_o, who had 20% ANE, for example is not relevant at all to South Asia yet you include it in your models. Do you dis agree with David's apADM results? The various groups in Swat Valley didn't have on average 9% Steppe_MLBA_East admixture like you've proposed. They had 15-20%, as my models & now qpADM show. "You might have to start paying attention to that 42% Iranian admixture." Seriously dude? Are you really going down that route again? Indo-Iranian languages are from the European Steppe. The evidence, including mtDNA which only I really understand the significance of, leaves no other possibility. qpADM resolves the issue of confusing ANE for Steppe & vice versa in G25. And qpADM rejects the high amounts of ANE in Rob & Alberto's models for Swat Valley. That debate is over, let's move on. Goes without saying now that the people and culture of the Inner Asian Mountain Corridor (IAMC) had a real influence on Proto Indo Aryans. The origin of cremation rites, Soma and perhaps some early Rigvedic deities all lie in that region probably. People interested in early Indo-Aryan religion and culture should investigate this further. The early Proto Iranians on the other hand could have taken a different route, that is, not along the IAMC. A lot of the pieces of the puzzle would start fitting together if we find a couple of L657s from the IAMC region. It seems Proto Indo-Aryans from this region proceeded straight into the Indus plain without interacting much with the BMAC, at least genetically. @All Please check out my sketch of IE migrations in the light of the new data. I have modified the image David used in his previous post. Disclaimer: I am in no way associating Z2103 = PIE or R1a Z93 = Uralic. I am just marking the areas where these haplogroups have been predominantly found in ancient samples. All of the necessary Dali_EBA-related ancestry in the model is present in the Sarazm_Eneolithic-related node labeled ANI1. In other words, the Indus Periphery/Civilization population already had Dali_EBA-related ancestry. It was R1a-Z93 that migrated east, probably from north of the Black Sea. That's why it was associated with a more western steppe population than R1b-Z2103 (Sintashta is more western than Yamnaya). When Sintashta moved into the Trans-Ural steppe from the west, it incorporated previous steppe and forest populations from the region into its ranks. That's why there are very eastern outlier Sintashta samples with R1b and Q1a. But keep in mind that R1a-Z93 also migrated west into the Balkans, because it's present in that Sintashta-like sample from MLBA Bulgaria. You left that out of your map. @Davidski Yes I could be wrong. Also this model is merely my own attempt at understanding IE migrations, but inspired by previous authors as well. But of course I understand many will not agree with this model. Thanks for your feedback. Your map is definitely wrong. R1a-Z93 isn't native to the Urals. It got there with the ancestors of Sintashta from the west. Most of the R1a-Z93 Sintashta samples are very western, while the R1b and Q1a individuals are much more eastern. Have you looked at the genetic structure of Sintashta? Have you considered what it means? Have you looked at the genetic structure of Sintashta? Have you considered what this means? I understand the "western" z93 individuals as coming from the Ukraine region with Corded Ware/Abashevo and the "eastern" R1b-Z2103 as coming from Yamna/Poltavka. Of course I would be wary of associating R1a Z93 = Uralic too, but it seems Proto-Uralic speakers were present to the north of the Proto Indo-Iranian speakers of Sintashta who were both of Z2103 and Z93 lineages, according to the latest article. That's why I marked them in the map there. Well it seems to me like you've got things backwards there. It was the R1a-Z93 population that was expanding both east and west, and incorporating R1b-Z2103 and Q1a people north of the Caspian as it moved into Asia. Also, I'm not sure why you think Sintashta would adopt language from the R1b/Q1a minority, considering that, by all accounts, it was a rather well armed and advanced group of seemingly very determined people? Wouldn't they be the ones spreading language? That could explain the Indo-Iranian and Indo-Aryan loans in Uralic, but no reciprocation, no? And considering that Sintashta belonged almost exclusively to R1a-Z645, then it's likely that its R1a-Z645 ancestral population also gave rise to Balto-Slavs, who are also rich in R1a-Z645. But I've got a bad feeling that you'll soon move on to the topic of the Balto-Slavic homeland somewhere around Tollense in Germany. However, be warned, if you ever do that, I'll start deleting your posts. @David "But I've got a bad feeling that you'll soon move on to the topic of the Balto-Slavic homeland somewhere around Tollense in Germany"
"Also, I'm not sure why you think Sintashta would adopt language from the R1b/Q1a minority, considering that, by all accounts, it was a rather well armed and advanced group of seemingly very determined people?" Just to clarify, I wouldn't say Sintashta adopted the language, but whatever pre-Sintashta R1a-rich group that came from the immediate north-west. You are right, Sintashta was probably already speaking Indo-Iranian and technologically advanced. Interesting new paper on ancient horse DNA. It seems like the main domestic horse Y-hg, Y-HT-1, came from the Middle to Late Bronze Age steppe, but it's hard to pin down its origins prior to that because it doesn't appear in any Eneolithic/Early Bronze Age samples. However, there was another dominant Y-HG during the Bronze and Iron Ages, Y-HT-4. Its earliest attestation is at an Early Bronze Age site at Mayaki, eastern Ukraine. Pretty sure that both Y-HT-1 and Y-HT-4 are the Proto-Indo-European horse Y-hgs. I'll blog about this soon. Honestly, not overly enthusiastic about showing how another 20 populations or so look in my qpGraph tree. Keep in mind that I did a lot of testing before I published the post. If anyone's interested in designing new trees that help to distinguish directly Steppe_MLBA and West_Siberia_N streams of ancestry in the Swat samples, then I'll run them. This is your qpgraph of brahmin India from July 2017. This is your qpgraph of brahmin India from Apr 2018 today. Why do they look significantly different? Ofcourse you would say the new samples were not available back then when you made the first tree. what makes you think all the possible sources and samples are available at this moment then? And why should the tree you have put up be the right one? Hope we are not suffering from the "Kupmanduk" syndrome. They look remarkably similar to me, both say Brahmin ~= 1/3 each Steppe, Iranian Neolithic, AASI. I'm going to wade in here at risk of cross-fire. If I understand the anti-steppe argument here, what they're really proposing is that Swat be modeled as late Turanian farmer (so extra Anatolian), Siberian/ANE, and Indus Periphery, right? Davidski, very generously, ran his tree with WSibN, Gonur1_BA, and IndusPer and it didn't work. Davidski, I have to think Fig 2C in the paper (the qpadm color bars) is confusing some of us. Specifically that SA_IA isn't showing any EHG or WHG, while the steppe samples of course are, while SA_IA is showing a lot of Siberian. Did their qpadm runs just not permit more than four source populations? If that's the case, I could understand the algorithm expanding the Siberian, which was present in both the Turanian farmer and Indus Periphery, to accommodate the small amount of EHG (double-diluted). Or is something else going on? <markers, ID, link to study, etc.)? and this is a very valuable resource for us. It could be that those IEs possessed high Emotional intelligence resulting from superb religion. They were welcomed not only as mercenaries but also as leaders and priests. Look how similar Greek and Indian philosophies are. Both came from common IE religion. Now, knowing their origin we will be able to reconstruct it. "you guys have to come up with an actual decent explanation as to how such a socially and demographically marginal impact indo-Europeanised an entire civilisation. And it seems that none of you have the ability to do so which is why you waffle"
The BMAC to Andronovo movement brought Iranian languages to Andronovo. Where is the Graeco-Aryan fire cult before 1500BCE in Andronovo? Camels which Indo-Aryans use an IE word for? The Soma/Haoma have their origins in south as does the IE dragonslayer myth. What they are proposing is that Indo-Iranians burrowed everything Indo-European from non Indo-Europeans. Like I said in the previous post, no more discussions about the meaning of the Rigveda. All such discussions will be deleted. Nah, the earliest Y-HT-1 samples are from Slovakia and Siberia, so Y-HT-1 is from the steppe. It made it to West Asia later. Both Y-HT-1 and Y-HT-4 are probably from Sredny Stog II. "All of the necessary Dali_EBA-related ancestry in the model is present in the Sarazm_Eneolithic-related node labeled ANI1. Yes, there is Siberian ancestry in Sarazm. However, Sazarazm is a sample from 3500 BC. So instead of using a chronologically-jumbled set of sources, I used samples hugging 2500 BC (Shahr _I, Dali EBA, Gonur_1BA, etc). I don;t insist is has to be this way, but at least its modelling on like with like. Perhaps a few percent lower than your estimates, but same ball-park. So no argument (& never has been), we have evidence of groups derived from Sintashta admixing into Swat and SCA; however they appear to have undergone a metamorphosis. And this is odd, because to use the Mycenean analogy, there we do clearly see tumuli in Epirus & Macedonia derived from Vucedol tradition. But I ll leave it there, Im no Rig Veda expert. The Swat samples have an abnormally high level of ANF admixture which is lacking in most South Asians. I m inclined to think that this is because of some BMAC contacts. This is the likely reason for the inflated steppe_mlba in the Swat samples. But using the same admixture sources as yours, do modern South Asians also show 15 % steppe_mlba ? When the BAM files be released ?. It is written and spoken in a language which is called Vedic Sanskrit - ancestral to classical Sanskrit - and it is very archaic. The language is such that the meaning of many verses are still a mystery to the linguists inspite of 2 centuries of effort. It is also considered a revelation - yes much like the Quran of Muslims. There is a lot of allegorical stuff and there are many words whose meaning in Rigveda is quite different than what is otherwise known in the historical period. This therefore gives quite a lot of room for vested interests to interpret some selective verses in a way that suits their purpose such as trying to find the steppe parallels in Rigvedic society. All such people are quite oblivious to the fact that Rigvedic geography extends from western UP to Afghanistan. It knows no region beyond. The core region is ofcourse Haryana and western UP. This is also quite uncannily the geography of the Indus civilization. And yet, surprisingly, all the placenames and rivernames are of Vedic or IE origin. If the Indus people spoke some other distant languages unrelated to Vedic, how did this massive linguistic replacement take place with such purported insignificant migration ? The inescapable reality that should dawn on any sensible person who is not constrained by some rigid beliefs, is that the people of Indus civilization were Indo-europeans, perhaps of the Greco-Aryan stage. Now if Indus civilization is Indo-european is that not a brilliant thing ? It would actually make much more sense as to why the Indo-Europeans ended up dominating the EurAsian region so much. It can also links with the Semitic, kartvelian and other languages of the Near East which are quite apparent in Indo-European. Lest one forgets, there is also a sound linguistic argument proposed by Johanna Nichols which can fit very nicely with the PIE origin in the IVC region. When the Indo- Europeans conquered parts of the ancient Near East, through Hittites and Mittani, these groups eventually got assimilated with no trace left in the present of their languages. Yet a hypothetical migration of such people in South Asia, in a region which was home to the largest Bronze Age civilization of its time, much larger than anything the Near East had on offer, with no visible trace of migration made such an impact that within a few centuries the IVC people completely forgot their their pre-IE languages. How that hell did that happen ? Arguing for such an extraordinary turn of events requires extraordinary proof. And where exactly do we see that ? Another interesting thing is that the elephant suddenly appears in the Near East in the 2nd millennium BC, in the region of Syria, as a likely export from South Asia, and disappears by the start of the next millennium. Now what happened in Syria in the 2nd millennium BC ? Well the Indo-Iranian Mittani ruled over there in that period. We also see the Zebu making its presence felt in the Near East in Anatolia and other places in the 2nd millennium BC when we also see the Hittites and Mittani for the 1st time. All of this is just co-incidence I m sure. RV has a lot of IE elements common to Greeks and Slavs, so their origin can be debated. This is correct. It's probably the smartest thing you've ever said at this blog. However, despite this, it's obvious (at least to the people who actually understand the data) that the ancient Swat populations do have significant Steppe_MLBA ancestry. It's a composite effect; Steppe_MLBA + some BMAC adds up to a relatively high level of Anatolian/EEF-related input. But keep in mind that no one with a bit of sense is ever going to take you seriously if you keep pushing for a PIE homeland in South Asia. Just give it up. "All such people are quite oblivious to the fact that Rigvedic geography extends from western UP to Afghanistan. It knows no region beyond. The core region is ofcourse Haryana and western UP. This is also quite uncannily the geography of the Indus civilization. And yet, surprisingly, all the placenames and rivernames are of Vedic or IE origin. If the Indus people spoke some other distant languages unrelated to Vedic, how did this massive linguistic replacement take place with such purported insignificant migration" ? Even tough I don't agree with OIT I think what you're pointing out is very interesting especially the questions of the place names. India in this matter is quite similar to the situation in western europe. Massive IE place names without a clear demic invasion. The gimbutians should give an answer at least. @Vara "The BMAC to Andronovo movement brought Iranian languages to Andronovo. Where is the Graeco-Aryan fire cult before 1500BCE in Andronovo? Camels which Indo-Aryans use an IE word for? The Soma/Haoma have their origins in south as does the IE dragonslayer myth. What they are proposing is that Indo-Iranians burrowed everything Indo-European from non Indo-Europeans." Cremation existed in the IAMC region before it was adopted in the Fedorovo phase of Andronovo. Probably the same for Soma and other elements of early Indo-Aryan culture. Soma is native to the high mountains of the IAMC region and Pamirs. Did Greeks have a fire cult though? The dragon slayer myth has been shown to have a much earlier origin common to all IE branches because they all possess the motive. But you could probably find such myths in other language families too since it's based on a common archetype. So don't know how "IE" it is. Re: the paper about horses, I don't think that it's really important to know where the HT-1 haplotype was originally from, since early domestic horses had the 4 different haplotypes and HT-1 has just been selected for during millennia. I think we'd need autosomal information from late wild horses (c. 4000-5000 BCE) to see which ones form a clade with early domestic horses from c. 2500-2000 BCE. We already have autosomal information from the latter, so we'd just need some genomes from the former. There really aren't many options, with Ukraine being the best one, and maybe Central-Eastern Turkey a distant second one. There seems to have been wild horses further east (South Caucasus/South Caspian) so that would be possible too. Y-HT-2 or Przewalski's horse was not domesticated, it was used for meat. West Y-HT-3 and East Y-HT-4 these horses could be harnessed in carts, the degree of domestication is unclear. Y-HT-1 these horses are fully domesticated and their distribution is strongly associated with widespread of the chariots, this is, charioteers' horses. The selections were made according to the degree of domestication, that is obedience. Co-fitting with Ust-Ishim, West Siberia N, and Hajji Firuz, and Sarazm, reduces Sintashta ancestry to 9% in Loebanr. I will try to produce graphs for each and post them as time allows. I will also drop BMAC into them to see what that does. "The word for camel is thought to be non IE and from a Central Asian substrate common to Indo-Iranian. " The Indo-Iranian word for camel(ushtra) is from PIE *usr- (auroch). "Probably the same for Soma and other elements of early Indo-Aryan culture. Soma is native to the high mountains of the IAMC region and Pamirs." There is no sign of that which is why the classical steppe theory has them burrowing it from BMAC. "Did Greeks have a fire cult though?" Not exactly the same as the Indo-Iranian one but there was some sort of a Mycenaean fire cult. See Hestia and Tabiti as well. "But you could probably find such myths in other language families too since it's based on a common archetype. So don't know how "IE" it is." It wasn't common before the Iron Age. It was only after Indo-European influence that Caucasian and Semetic gods became dragonslayers. I had commented a while back on the significance of mountain corrridors to riverine cultivation. There are two corridors. one from the hindu-kush to altai and the other from south Caspian to north west caucasus. Both branches converge on Bronze Age cultures to their south. eastern anatolia, bmac, jiroft, ivc etc. Both corridors are connected.there was pastoralist traffic from the beginning of crop and animal domestication. We have Anatolian languages to the west of this and Tocharian at its eastern extremity. @Vara Also according to the latest papers, Indians have little to no direct BMAC ancestry. Which means the early Indo-Aryans almost completely bypassed the BMAC culture. I think many features of Aryan religion which have until now been credited to BMAC influence may have been due to the influence of the IAMC cultures instead (the Dali like people who inhabited the IAMC region before the Andronovo expansion and who are known to have practiced funerary cremation according to Michael Frachetti). Cremation is completely unknown in Sintashta and early Alakul Andronovo. Where do you reckon the Indo-Aryans could have adopted it from? For thousands of years, the Eurasian steppe has been a centre for human migrations and cultural change. To understand its population history following the Bronze Age migrations, we genome-sequenced 137 ancient humans (~1X average coverage) covering the past 4000 years. We find that Scythian groups that dominated the Eurasian steppe throughout the Iron Age, were highly structured, with diverse origins comprising Late Bronze Age herders, European farmers, and South Siberian hunter-gatherers. Later, Scythians admixed with eastern steppe nomads that formed the Xiongnu confederations, and moved westward in the ~3d/2nd century BCE, forming the Hun traditions in the 4th-5th century CE, carrying with them plague basal to the Justinian. These nomads were further admixed with East Asian groups during several short-term Medieval khanates. These historical events transformed the Eurasian steppe, from being inhabited by Indo-European speakers of largely western Eurasian ancestry, to the present-day's mostly Turkic-speaking groups that are primarily of East Asian ancestry. "That is a Wiktionary etymology with no references given for it. Alexander Lubotsky certainly disagrees with this"
There are many references given for the IE etymology. From JP Mallory: "A more controversial set of possible cognates supports a PIE *usr- ‘aurochs’ (which retains such a meaning in Germanic, e.g. OE u¯r ‘aurochs’, OHG u¯ro u¯rochso ‘aurochs’, but in the putative Indo-Iranian cognates may mean anything from ‘bull’ to ‘camel’, e.g. Skt usra´- ‘bull’, usra¯- ‘cow’, Pashto u¯sˇ‘camel’)." "Which means the early Indo-Aryans almost completely bypassed the BMAC culture." I agree. We have to go back to the origin of BMAC religion in East Iran. "the Dali like people who inhabited the IAMC region before the Andronovo expansion and who are known to have practiced funerary cremation according to Michael Frachetti"
I forgot about that. Begash apparently had some cremation ritual in the late 3rd millennium. However, the earliest steppe culture (Fedorovo) adopt it 1500 BCE after Indo-Aryans reached India. "Cremation is completely unknown in Sintashta and early Alakul Andronovo." Early Andronovo is when Indo-Aryans and Iranians split according to the regular steppe hypothesis. If fire worship, a big part of Graeco-Aryan religion, reached the steppes 1500 BCE then Andronovo was not Indo-Iranian. Thanks again. Didn't seem to do the trick. Hmm. Guess we'll have to wait for Chad to post his models. The map is dated, I think, because I remember seeing it a couple of years ago, but it was probably made back before CHG was discovered and characterized. Don't confuse "ENF" in this map with EEF. ENF does NOT precisely correspond to EEF. Rather, it's a *very* basal-rich component with reduced Villabruna-like character compared to EEF. Look at Sardinia: ENF is 65%. The rest is "WHG" even though we know they are model essentially as LBK-like EEFs, not Iberian_Chl or North Euro EEF-like. So, WHG in this case corresponds to any kind of Villabruna-related ancestry, which would include Anatolia Neolithics' UHG(some 60% of their ancestry). I.E: WHG doesn't specifically capture the *European* WHG-like ancestry early neolithic farmers would have picked up during their expansions. Notice also the lack of a "CHG" component on the map. In this case, such ancestry would be accounted for with a combination of ENF(very basal-rich) and ANE, which campture any ANE-like ancestry. Look at France and South Italy. The ANE is comparable yet we know French have much more steppe. What explains the discrepancy? Non-steppe associated CHG acquired from Bronze Age(and Roman age?) Anatolia. Also, take a look at Turkey with comparable ANE to Poland. Here, too, most of that "ANE" is not steppe-associated. So, in Poles and Russians(and all Europeans, really), some of that "ENF" would be associated with the basal Eurasian portion of CHG, not just w/EEF. As for "ANE-like"? Well, steppe-like is essentially comprised of ~50% ANE-like ancestry, from EHG and CHG. Double the numbers for ANE on this map and add a bit more. For SouthWest, Central and North Europeans, the numbers will be relatively close to what our current models show. SE Europeans like S. Italians and Albanians will deviate considerably from this as I've explained. Numbers will deviate a bit for Northeast Europeans due to excess Narva-related ancestry. "The core region is ofcourse Haryana and western UP." Exactly! Still is, imo. I've been on about this for the past few threads now. THIS is where we should to be looking for steppe_MLBA-rich proto-Brahmans. Punjab may have been the core of IVC-era South Asia(in terms of being a trade hub for the sub-continent, enjoying a high population density, setting regional trends, etc. ), but it passes into relative obscurity by the Middle Vedic period and is essentially eclipsed by Western UP and the Gangetic plain in general. Guptas, Mauryans, Nanda, Magadha, Delhi Sultanate, Early Mughal Period weren't Punjab-centered. AFAIK, Medieval Jat migration from Sindh and their cultivation of the land in the following centuries is what ultimately boosted the region's importance. Thank you for the clarification. So to sum up steppe component is twice the figures indicated on that map........still not a great figure really ( at the most is 30%)...and also you don't consider a very important thing....which was the distribution of the population in LN Bronze age in europe?.....back then ( unlike today) scandinavia, germany poland were much less populated than western and above all southern europe ( a big steppe component in norway was a nothing burger compared to medium farmer component in italy! )...so the impact of the steppe component must be "weighed" according to population size", the regions in europe with the highest steppe admixture were the ones having less population a fact we all should be aware of. Do you agree? How much EEF+WHG there's in Khvalynsk, Sredni Stog and Yamna? I've heard that Corded Ware has less CHG than Yamna and Bell Beaker? Is that true? ^ It's not easy to recover DNA from that region. Yeah, again, it's ROUGHLY twice the "ANE" number with a correction factor added in that seems to be ~25% of this product. So, for Sweden: 2x15.5=31. 31+.25(31)~39. Reasonably close. Barring SE Europe, it's a relatively good estimate for relative steppic ancestry. I agree, though, it's a rather outdated model and more abstract. In general, I agree: the more densely populated a region is, the less of an impact migrants will have. It's not just a function of this,though, but also of mediators though which steppe ancestry reached Southern and Western Europe. Which mediators? BB-like mediators from Germany /Czechia carrying ~50% steppe and ~50% GAC-like EEF. To borrow Rob's term, these people were not merely carrying on the cultural kurgan legacy but have largely underwent a metamorphosis as we see in India. This was a very defining period for Europe. It is through them that Iberia, France, Britain and Italy obtained steppe ancestry. In the case of Britain, there was a 90% replacement rate. In Bronze Age Northern Italy it could have been about 60%, judging from BB_Northern_Italy modeling. Pretty significant and comparable to the population turnover in 2500BC Germany which created the *genetic* BB horizon. In Iberia, it was more like 20-30%. Both distance to destination and population density may explain the reduced impact there. Greece was a different story, indeed. I mean, they were proto-urban at this time, but the mechanism through which they received steppe differs somewhat and we don't know who mediated the transmission there, so can't comment on population turnover. Were mediators Yamnaya_like or Balkan_BA-like? Bronze Age Balkans to the north, evidenced by Dalmatian and Bulgarian_BA looks to have gotten its ancestry *directly* from Yamnaya groups. Basically LBK-like + Yamnaya:no sign of WHG-rich EEF ancestry. They're ~35% Yamnaya-like. In later centuries, movements from Anatolia diluted this. Slavic impact was on a devastated Balkans was considerable and steppe ancestry increased as a result. Ok So JP Mallory is a linguist now? I agree there may be different proposed etymologies, but I prefer to go with Alexander Lubotsky, an actual Indo-Iranian linguist, on this matter. "However, the earliest steppe culture (Fedorovo) adopt it 1500 BCE after Indo-Aryans reached India." I don't think the origin of Proto Indo Aryans lies in the Fedorovo culture. Especially after the latest Narasimhan et al paper, because the samples are all Z2124. Proto Indo-Aryans are probably an early offshoot (before 1500 BC) who made their way into the Afghanistan region winding their way through the IAMC, pretty much skipping the BMAC. But exact models would have to wait until L657 is found in Central Asia. besides........in central western europe we have in less than 1500 years ( roughly from 2500 to 1000) the formation of four (very) different language families ( italic, celtic, germanic and latin) while at the same time the same source population was giving birth in a straight line that goes from the baltic to the gulf of bengala! to 2 language families so connected and similar ( indoaryan and baltic ). To be honest there's something wrong here. I wonder why nobody raises this issue that seems to me like the proverbial elephant in the room! With the data we have someone could make accurate maps for the distribution of Anatolia EF, Iran EF, and Steppe ancestries. "Ok So JP Mallory is a linguist now? I agree there may be different proposed etymologies, but I prefer to go with Alexander Lubotsky, an actual Indo-Iranian linguist, on this matter." For Dyeus sake Mallory has a PhD in Indo-European studies, pal. how can a rich R1a population ( corded ware) mixing with GAC produce ......a rich R1b population in central western europe......no R1b has ever been found in corded ware culture. ( no R1b P-312, U106,L-51 has ever been found in the steppe so far...)"...................I wonder why nobody raises this issue that seems to me like the proverbial elephant in the room!" R1b-Z2103 can be found within the oldest Bell Beaker sites in Eastern Europe. It can be found in close proximity to the oldest Corded Ware sites, Sintashta sites, Afanasievo sites. As you can see, these are not optimal fits; but the figures of 10, 5 and 20% are broadly consistent. Lubotsky doesn't go over the etymology of the word. He just says it's a new animal encountered by the Indo-Iranians and I agree it's not a PIE animal. Where do you think the Indo-Iranian homeland is? It needs to have fire worship and many other Indo-Iranian features Sintashta and early Andronovo lack. "A second important study for understanding the evolutionary history of R1b-343 and was published by Balanovsky et al. in 2017. Here, researchers utilize 588 samples provided by Armenians and Georgians. According to Balanovsky and others, Western Europeans belongs to the R1b-L51 variant of R1b-M343. However, the Yamnaya samples from Haak et al. (2015) belong to R1b- Z2103, the Eastern European variant of R1b-M343. Thus, the Yamnaya were not the source of R1b variation in Western Europe as asserted by Haak and others." Nice description. However, I would suspect modifications on some aspects. E.g. (1) "In general, I agree: the more densely populated a region is, the less of an impact migrants will have." Although southern Europe might have had greater population density in general, it is regionally & temporally specific . I.e., after 4200 BC, the core of the Varna-Karanovo civ. area appears almost wholly deserted. The lake transgressions caused a significant population exodus, apparently southward to Thrace and Anatolia. IT lay bare for several hundred years before it was again repopulated from the south and post-Mariupol /Cernavoda northerners. (2) "Pretty significant and comparable to the population turnover in 2500BC Germany which created the *genetic* BB horizon." We actually don;t quite know what the population turnover in Central Europe was. It cannot be deduced on inspection of changes in steppe ancestry, as we have to take in relative populations pre- and post. A lot of people make errors here. Even Haak's seminal paper in 2015 made the claim that CWC represented a 70% turnover in C.E.. That's simply erroneous. What it really represents is 70% Yamnaya ancestry in CWC themselves; not all of C.E. There were co-existant cultures in C.E. which had No or little steppe ancestry (Late TRB, GAC). Yet obviously steppe ancestry proved to be persistent and demographically co-dominant in north central Europe, but probably on a different basis than some might imagine. Sure there was the ideology etc, but what really separated them was their more sophisticated agriculture than the slash-n-burn TRB folk, which flies in the face of the rampaging nomads image people still discuss. You then have the succeeding phase - Unetice - which is Hg I2 dominated, not to mention Iron Age groups. As the authors of the Lombard paper made an effort to point out, a complete picture depends on more data from MBA - & EIA from Europe. (3) "In Iberia, it was more like 20-30%. Both distance to destination and population density may explain the reduced impact there." Yes in terms of raw Steppe ancestry, but the overall turnover in Iberia seems to have been huge. It goes from 90% I2a2 lineages to virtually zero. Something very different was happening in the Atlantic than central Europe & SEE. Many people, obviously of Atlantic / R1b ancestry themselves, rest their opinions on this periphery of Europe, which is problematic. Uhmmmm, you know Latin is an Italic language, right? Le lingue italiche, un tempo considerate una famiglia linguistica indoeuropea unitaria, parallela ad altri suoi sottogruppi, in realtà costituiscono probabilmente due distinti rami della famiglia indoeuropea, entrambi attestati esclusivamente in territorio italico e, di conseguenza, avvicinate da fenomeni di convergenza. They are not probably genetic related like for example proto-germanic OK? David, how can we subscribe to your blog to get updates on new posts. - in other words, it's idiotic to argue that a Steppe_MLBA population with no Central Asian admixture can be assumed to be a source of language change in South Asia, but a Steppe_MLBA population with, say, 20% Botai and 20% BMAC admixture, cannot be...because why exactly? So please quit acting stupid and try to raise the level of the discussions here. Genes don't speak languages, people do, so evidence of population shifts is more important than precise ancestry proportions. Like many, Davidski believes in real truth, and this is a great example. No doubt about that; David is, by far, one of the most objective voices here at the blog. He doesn't have any axes to grind. I've never read him holding untenable viewpoints. If the data disagrees with his notions, he changes his notions, as any sensible person should. Shahr_I_Sokhta_BA1 is quite an intriguing sample. Based on some analyses I've done, around 60% of Shahr_I_Sokhta_BA1's genetic ancestry is derived from the same West Eurasian ghost population which constitutes most of the genetic ancestry seen with the IVC_periphery samples. The other 40% is almost evenly divided between Iran__N and Iran_Chl. So, we could probably find a completely West Eurasian IVC-affiliated ancient population (at least in genetic terms, although perhaps the cultural affinity to IVC might be muddier) a bit further east. Perhaps, we need to look in what is now southeastern Afghanistan/southwestern Pakistan? Also, I think we are in desperate need of an actual ancient AASI sample. I'm pretty sure that even the least admixed modern proxies will turn out to be extremely complex mixtures, when compared to an "actual" ancient AASI population. For that though, not sure where it would be best to look? Mesolithic South India/Sri Lanka? "Genes don't speak languages people do, so evidence of population shifts is more important than precise ancestry proportions." Indeed, although proportions are surely not wholly irrelevant, especially when objectively assessed. As an avid enthusiast on South Asia, you undoubtedly know of the rich anthropological record of Sri Lanka, which spans from 33 lya to the Mesolithic and Megalithic Eras. @Vara "Lubotsky doesn't go over the etymology of the word. He just says it's a new animal encountered by the Indo-Iranians and I agree it's not a PIE animal." Lubotsky places it under the list of loanwords common to Indic and Iranian. So it's obvious he thinks it is not a native PIE word. "Where do you think the Indo-Iranian homeland is? It needs to have fire worship and many other Indo-Iranian features Sintashta and early Andronovo lack." I don't think the homeland needs to have all the characteristics of later Indo-Iranian culture. Like cremation and fire rituals for eg, which I think they later adopted from Central Asia. "They got cremation from here:"
Yes I agree that is possible. But I still prefer IAMC because it can also explain how cremation spread to Andronovo regions after 1500 BC. @Yee "For Dyeus sake Mallory has a PhD in Indo-European studies, pal." DA101, a Tien-Shan Hun from about 300 CE was in this Y haplogroup? Chetan, you need to understand that the opinions of such linguists are highly speculative and far from conclusive. You can look at, for example, the case of Retroflex phonemes in Indo-Aryan. It had been argued by linguists that this was part of a Dravidian substrate for a long time, and was one of the main arguments used against an Indian urhmeimat. However, that idea is not tenable any longer given we know that retroflexes are most common in the Northwest and can also be found in some Eastern Iranian languages too. Regarding burial customs, how do you explain the emergence of Exposure, as used by the Zoroastrians, when this is only found around Tibet? Open genoms: Can you look at i4550 zvejnieki sample,it belongs to Q y dna and will be interesting to know if there is ancestral to nordic y dnaQ? Retroflex in Vedic is recognized more as non Dravidian but not reconstructed in IE. So it is still regarded as a local substrate. Can you provide examples where they may be reconstructed in IE. I think the burden of proof is on you to show that it is not PIE. The argument that "Hey this thing looks a little different therefore not PIE" is not a very strong argument? Just compare it to the Vedic pitch accent, had they not found a lesser version of it in Homeric Greek, it would have gone the same way, 'proof' of substrate influence in Vedic Sanksrit. Anyway, I do have Retroflexes in my own reconstructed PIE, called Vedic Sanskrit. It is also found in Khotanese, which was spoken quite far from South Asia, so how did it end up there if it came from a South Asian substratum? @mzp Linguistic arguments are not to be taken as pseudo-science like you say. We have 100+ years of linguistic research into PIE and we are not going to get anywhere by ignoring those. The reason retroflexes are not reconstructed for PIE is because they are absent in all IE branches except Indo-Aryan. And in Indo-Aryan, retroflex sounds follow a regular shift from non retroflex phonemes in Iranian/other PIE branches. It's not some totally random thing like you claim. Well aware that raw steppe ancestry does not necessarily correspond to actual population turnover(unless we're talking about primary recipients of it in BA Germany), hence why I stressed secondary mediators to Old Europe. This is also why, in my previous posts, I always stress the notion of indigenous EEF ancestry vs that which has been carried over from Central Europe. In strong agreement regarding the coexistence of different groups in the same geographical space like CWC and GAC. RE/Iberia--- There is good reason to believe that secondary mediators relevant to the region were essentially German BB-like in terms of their EEF:steppe ratio. We have a couple of such suspected migrants in our sample set. When I mentioned 30% turnover, I had exactly this in mind, but perhaps I underestimated w/respect to those geographical areas and/or was thinking of an earlier date atm like 2200BC. Though, to extend your logic, maybe it was only 30% if we take the ENTIRE peninsula into account, not just those sampled communities. Celt-Iberian period likely represented further population turnovers, particularly in Galicia and NW. So, all in all, Iberia's genetic history is very much an extension of Western-Central Europe. Prior to the Roman period, there was essentially a straight continuum going from Czechia to Algarve. It is SEE which differed w/respect to its steppe donors and extra Circum-Aegean ancestry. Retroflex consonants is one of the strongest arguments that the origin of PIE and Indo-Iranian languages is not related to the region of India, it is an unambiguous argument, categorical. It does not leave a chance for such development. All linguists are unambiguous and categorical, it is impossible that PIE come from this region, such a hypothesis is not even considered by linguists, because it is impossible. In Vedic Sanskrit there are few still. And even in Vedic Sanskrit it is perfectly visible as over time words with retroflex consonants are borrowed, reaching the peak in Classical Sanskrit, they have no Indo-European etymology. I'm more inclined to think that Pit Grave, not CWC was responsible for the bringing of steppe ancestry seen in BB. Perhaps its western offshoots were, in fact, R-L51. You mean Indo-Iranian, because they are found in IA, Dardic and some Iranian languages. I dont wanna go into this discussion too deep. My point still holds. These guys were pretty confident it was a specifically Dravidian influence, but ofcourse now the position has changed. You see the problem with using non-falsiable theories to push a political/and or biased academic position. Placing Hittite as more archaic than Vedic Sanskrit. Placing PIE in Centum territory. and these all affect the 'reconstruction' of PIE. "Lubotsky places it under the list of loanwords common to Indic and Iranian. So it's obvious he thinks it is not a native PIE word." Let's be fair here. He just assumed it is a loanword and didn't go over why Mallory was wrong. Also, I quoted Mallory for you because he is a strong proponent of the Steppe Theory because if cited someone else you'd go: "consensus". "I don't think the homeland needs to have all the characteristics of later Indo-Iranian culture. Like cremation and fire rituals for eg, which I think they later adopted from Central Asia." Basically my previous point. Somehow the Sintashta Indo-Aryans and Indo-Iranians picked up the same fire cult from two different sources, that is somehow very similar to the Mycenaean one, the Saoma and Rivers similar to those in Afghanistan (Sarasvati/Harahvaiti). Oh, and somehow Indo-Aryan religion make it to Andronovo a century or two after Indo-Aryans left for India. Isn't that special pleading? The reason the classical steppe theory has Indo-Iranians splitting in BMAC is so that they could explain the root religion of Indo-Iranians and other similarities like the shared rivers in South Central Asia, which can only be explained if they split in the south, but the Steppe Folk that went through BMAC did not go to India and those that went to India did not go to Iran. Actually even the Steppe folk that went through BMAC did not make it to west Iran except as mercenaries and allies to the Medes. It is very simple we go back to Sarianidi and modify his theory a bit. Yeah, would be great to get a sense of pre-Neolithic genetic structure across India. Perhaps North India had some basal West Eurasian HG or even more differentiated ANE-like ancestry? Equally important: how drifted was AASI ancestry in the north compared to that in the south by the early Neolithic? "words with retroflex consonants are borrowed"
Where are Kalash, Khotanese, and Pashtu speakers borrowing retroflex words from? That classical sanskrit speakers may have borrowed words from Dravidian (retroflexed or not) is not very conclusive. Vedic Sanksrit speakers may not have come into close contact with Dravidians. Sarianidi had the simplest most unconvulated theory yet. Based on proper archaeology as well. The only problem is that he wasn't an expert on the texts but still he was a genius archaeologist way ahead of his time. The only criticism he got was that at the time Shahr Sokhteh was only Jiroft-Helmand complex site found. But he proved them wrong in 2006 when the Jiroft complex was discovered. @Vara "Basically my previous point. Somehow the Sintashta Indo-Aryans and Indo-Iranians picked up the same fire cult from two different sources"
All Iranian people didn't have a soma cult or a fire cult for that matter. In the case of Scythians, it's only a specific subgroup that is named "haumavarga saka" = soma drinking scythians. Nor did the Western Iranians like Medes have it. It seems the soma cult was restricted to the Afghanistan-Khorasan region. You need to understand that cultural features and vocabulary like this can spread areally without it being inherited from a common ancestor. And the Mycenaean fire-cult, if at all it existed, isn't closely related to the Indo-Iranian version. If you wish to say that, you need to give some references. So where do you think the Zoroastrians got Exposure from? It is only found in Tibet. We all know what jeunesse paper says about warrior ideology and so on..... want to point out what happened in northern italy ( where I come from and I know better) in the early bronze age after the so called steppe invasion. to give you an example we can compare the endless flow of migrants in the USA that were not of english breed.....a lot of people that outnumbered the british without changing a bit the language which is still the one spoken by the pilgrims fathers. As for R1b L-51 what do you think of the fact that it was bottlenecked ( maybe a single family or clan) in central western europe and started to expand only after 3000 BC? @Mzp My point was this whole soma ritual thing is something endemic to Central Asia rather than something that was inherited from a PIE stage. That's why you have Eastern Iranians belonging to this and Western Iranians not. Right, the evidence seems to suggest that much of the foundational ideology that was to develop further during the Bronze Age was actually in place before the main ~2500BC steppe infusion. The question is this, though: was it just a product of local EEF dynamics OR was there an earlier, demographically insignificant but culturally influential egress from the Ukraine as Jean Manco(and even Jeunesse himself hinted at, for that matter) proposed? Maybe these "stelae people"(first anthropomorphic stelae are attested to in Ukraine) comprised an important aristocratic segment of these architectural CW European Copper Age societies? I doubt that R1b-l51 was a local EEF lineage. There is no L23 or m269 of any kind to be found in pre-BB Western Europe. Evidence points to L23 bifurcating in Eastern Europe, but, again, did L51 arrive with Pit Grave migrants circa ~2700 BC OR was there a bottleneck stemming from R1b introduced by an earlier(Kemi-Oba related?) migration? I do not remember. I just remember that in Margiana he found ephedra and poppy seeds. "All Iranian people didn't have a soma cult or a fire cult for that matter." The Indo-Iranians had a haoma cult till the times of Zoroaster, who according to some was against the Haoma cult, and in Zoroastrian west Iran it was replaced with wine. All Iranians including Scythians had a fire cult but it's importance varied of course. "You need to understand that cultural features and vocabulary like this can spread areally without it being inherited from a common ancestor." That is true. Though, all versions of the theory has Indo-Iranians burrowing them before they split and after they went through BMAC, which is proven wrong. This whole scenario cannot explain the Old-Indo-Aryan influence on the Kassites and other Zagros folk because as Witzel explains that influence comes from BMAC. Also, to which Balanovsky paper were you referring in the other thread? Genetic differentiation between upland and lowland populations shapes the Y-chromosomal landscape of West Asia. Y-chromosomal variation in West Asian populations has so far been studied in less detail than in the neighboring Europe. Here, we analyzed 598 Y-chromosomes from two West Asian subregions-Transcaucasia and the Armenian plateau-using 40 Y-SNPs and 17 Y-STRs and combined them with previously published data from the region. The West Asian populations fell into two clusters: upland populations from the Anatolian, Armenian and Iranian plateaus, and lowland populations from the Levant, Mesopotamia and the Arabian Peninsula. This geographic subdivision corresponds with the linguistic difference between Indo-European and Turkic speakers, on the one hand, and Semitic speakers, on the other. This subdivision could be traced back to the Neolithic epoch, when upland populations from the Anatolian and Iranian plateaus carried similar haplogroup spectra but did not overlap with lowland populations from the Levant. We also found that the initial gene pool of the Armenian motherland population has been well preserved in most groups of the Armenian Diaspora. In view of the contribution of West Asians to the autosomal gene pool of the steppe Yamnaya archaeological culture, we sequenced a large portion of the Y-chromosome in haplogroup R1b samples from present-day East European steppe populations. The ancient Yamnaya samples are located on the "eastern" R-GG400 branch of haplogroup R1b-L23, showing that the paternal descendants of the Yamnaya still live in the Pontic steppe and that the ancient Yamnaya population was not an important source of paternal lineages in present-day West Europeans. @mzp1 you're chatter the subject. As it is clear from Rigveda, Soma is not ephedra, it is a drink made of mushroom Amonita muscaria, which grows in low temperate latitudes, and to the South is high in the mountains, from the mountain it is delivered to the Arian by eagle. This mushroom is also used in the form Soma of West Siberian peoples. I didnt say Some=Ephedra, I have no idea what Soma was, though I dont interpret it as a pure hallucinogen. Scythians liked their cannabis, not sure about the mushrooms though. Btw, one Beaker Netherlands and several Beaker Britain individuals have 67% Yamnaya ancestry. I think a possibility is they belonged to a nobility-upper class who mixed less with MN-farmer local who assilimated/immigrated into their communities. II am writing a utility to extract all the autosomal Reich Lab "1240k" SNPs from a BAM file (or directly from an ENA link to an indexed BAM file). Would it be acceptable if for SNPs that now have an rsID you had both the rsID and the Reich Lab SNP designation separated by a semi-colon? Do you need the Reich Lab names, or can they be substituted for the rsIDs when those are now available? Using the rsIDs whenever they are available will make it much easier to transition to hg38 from hg19 and move forward from there. It's surprising that even now, all the SNPs haven't been submitted yet. Also, would it hurt if additional 23andMe SNPs were added to the list, or do you rely on the list not having any extras? These SNPs not on the 1240k list, especially those with "i-numbers" that now have rsIDs, tended to be phenotypic and pathogenic SNPs which are often rare, but interesting to know about. I'm trying to maximize the number of SNVs with single alleles to include all those that were tested by any chip, as well as the 1240k list. If I can get the correct list then I can start extracting SNPs from the Eurasian Steppe study which you can immediately add into your Global25. So it's still there in good amounts. Assuming that they know a lot of things we don’t know yet and have a good reason to support this hypothesis we should start thinking about consequences if it is true. IE in Europe was spread by women from the South of Caucasus. R1a HG who mixed with IE women on the steppe created Balto-Slavic family of languages (Sredny Stog Dereivka –> CWC). IE migrated to India and Iran from the South of Caucasus; later mixed with incoming from the north R1a Andronovo Balto-Slavs derived from Sintashta and CWC and this led to the origin of Indo-Iranian languages. (I find the theory that Balto-Slavs and Indo-Iranians separated 8000 BC in the South of Caucasus and their linguistic similarities have nothing to do with R1a difficult to accept). (I find the theory that Balto-Slavs and Indo-Iranians separated 8000 BC in the South of Caucasus and their linguistic similarities have nothing to do with R1a difficult to accept). I don't think that theory is proposed by anyone. But you are forgetting that Western Scythians spoke a language classified as East Iranian, though it was probably an archaic form of it, close to Proto-Indo-Iranian. East Iranian's homeland is around Afghanistan, and Scythians took the language from that area to the North Pontic steppe maybe around 1200-1000 BCE (not surprisingly, those Western Scythians have some 15-20% admixture from Iran and surroundings), replacing whatever language was spoken by the earlier Srubnaya culture. So Balto-Slavic languages developed in a contact zone with that archaic Indo-Iranian laguage, as well as some old form of Celto-Italic-Germanic. Probably around Western Ukraine or thereabouts. So you don't need a split in the South Caucasus at 4000-4500 BCE. As for the R1 guys marrying Indo-European women... Let's wait and see. I'm sure we'll find a much better explanation than that one. I'm not sure if the files will be compatible with the Global25. They usually never are when done privately. But I can try them out. Yes, I'd need the usual Affx/rs SNP names, or at least hg37 positions.
" Soma is almost certainly ephedra, it certainly isn't amanita. " Soma is definitely a drink from Amanita muscaria, certainly Muscaria, but not ephedra. In the Rig Veda it is not interpreted as ephedra or any other plant, just like the mushroom. "Volumes have been written on this." It's proven. "I don't see how limited genetic admixture from the BMAC amongst Indo-Aryans translates to no cultural interaction with the BMAC"
It's not our problem that you can't see. 2. IE migrated to India and Iran from the South of Caucasus; later mixed with incoming from the north R1a Andronovo Balto-Slavs derived from Sintashta and CWC and this led to the origin of Indo-Iranian languages. There is no linguistic or genetic evidence that Balto-Slavs had contacts with Iranians. There is also no evidence that Scythians migrating to Europe were Iranians as their genetic profile, i.e. high East Asian component and very mixed Y-DNA make the theory that they were Iranians very uncertain. Balto-Slavic languages are closer to Avestan than any living Iranian language and closer to Vedic Sanskrit than Hindi. They are also more archaic and conservative than Avestan or Sanskrit and many words in Indo-Iranian languages can be shown to have a better etymology in Balto-Slavic than in Sanskrit or Avestan. The conservative nature of Balto-Slavic has been explained by many linguists by the fact that Balto-Slavs didn’t migrate and mix but are still living close to where they originated and close to PIE homeland. The overwhelming consensus sees Slavic as a central European language with some Scythian adstrate, which had very much been overestimated in the past. For all we know, Iranic languages appeared on the steppe in the Iron Age, specifically the post-Cimmerian period. Recall that the one 'Cimmerian' from Iron Age Hungary doesn't exactly support the notion that he was 'Thraco-Iranian'. The paradigms aren't changing because everything is going rather smoothly for the Kurgan steppe hypothesis. Obviously, no need to change what's working. Okay Dave. You're right. Afterall, Karl and Sein said so. Okay Dave. You're right. After all, Karl and Sein said so. More importantly, the data say so. Looking through the (north) Beaker genomes, I see we probably need to rethink (north) Beaker origins. Many have different kinds of farmer ancestry but similar amounts of Steppe ancestry meaning they are independent Steppe-rich+farmer mixes. Beaker Poland & a few Beaker genomes from Bavaria all have about 58% Yamnaya ancestry. But their farmer ancestry couldn't be more different. The distance is @11. Beaker POland's farmer ancestry most distantly resembles Globular AMphora, Bavaria Beaker's farmer ancestry resembles Sweden Funnel Beaker. Why would Bavarian Beaker have acquired its MNE ancestry from something like Sweden TRB ? Maybe it was because of trade up and down the Elbe and not a bulk migration ? "Maybe it was because of trade up and down the Elbe and not a bulk migration ?" LOL. The Elbe takes you to northeast Germany, which was GAC territory. Rob: Yes in terms of raw Steppe ancestry, but the overall turnover in Iberia seems to have been huge. It goes from 90% I2a2 lineages to virtually zero. Something very different was happening in the Atlantic than central Europe & SEE. We don't have enough of a time transect to understand when either I2a2 reduced in Iberia, or G2 disappeared in Central and SE Europe and T in Bulgaria. @Samuel, I don't think G25 (which I guess you are using) can necessarily break these farmer populations apart well (besides the obvious MN-EN distinction) but still will say you should probably not be using an aggregation of the Ukrainian and NW Polish Globular Amphora samples, if you are looking at trying to break apart farmer ancestry. 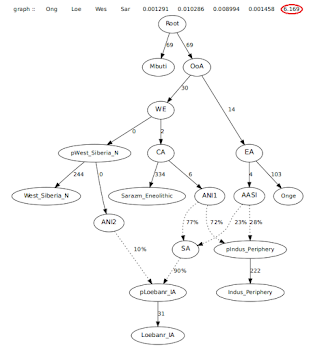 what’s the point of Sam’s points about MNE admixture?. Brunsbüttel. Need I say more ? I know your a solely an autosomes man, so maybe you need to look at the data more closely ? @Rob, so you know it all regardless of the gaps already? Why not articulate this picture in the form of a falsifiable prediction then? There are not so many specific Bronze Age samples. And that's a no on actually offering a prediction then? Yes, but we hardly have any Yamna or Yamna-related/like DNA west of the Dnieper. Overehelmingly just eastern Yamna atm. 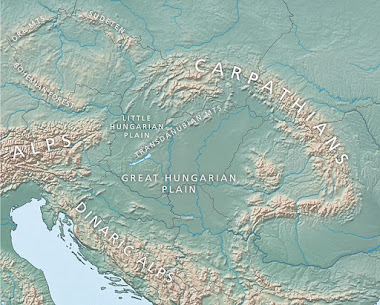 No genomes from Yamna colonies in eastern Hungary and none from the northern Carpathian edge. Still a thick fog of war. If it turns out they're just as dry, though, then we should give the stelae hypothesis+founder effects more serious consideration. This is seriously getting out of hand. David Reich and his band of anti-steppites need to be more clear with what they are suggesting so that objective scholars can criticize it to show it is wrong. What culture are they pointing to as the origin of PIE? They can't simply leave it at pointing south of the steppe to satisfy the politically correct. Isn't the first attestation of Slavs from ~600CE? Is the author suggesting Indo-Iranians lived South-East of Romania during this period and then migrated to Iran/SouthAsia? Also, since you seem to be an expert on the Hyporborean religion, can you point me to some Hyporborean religious texts? I find it fascinating that the Hyporborean relgion has so many correlations with not just Indo-European religions, but also religions of ancient Egypt and Sumeria. It is from T. Burrow “The Sanskrit Language””page 14. It shows how close modern Slavs are to Sredny Stog II and CWC populations and agrees with their migrations to Anronovo and India. I am not an expert on Hyperborean religion and no Hyperborean religious texts survived. But there is a prevailing view that Greek Orphico-Pythagorean mystery cults were influenced by some northern religions. Apollo was a Hyperborean god etc. They influenced the development of Greek philosophy. There are many stunning similarities between the oldest Vedic texts like RV and Greek philosophical texts coming from Orphico-Pythagorean tradition. The mystery religion itself didn’t survive and we don’t have religious texts, just few fragments. There are also many similarities between Slavic pagan traditions, Vedic traditions and Orphico-Pythagorean traditions. So the theory that they all have common Hyperborean origin seems justified as there are also common links in poetry, languages and genes. I cannot say more because David forbids discussing RV here. Thank you, reading it now! That excerpt is woefully outdated and has many many errors in it. "There are also many similarities between Slavic pagan traditions, Vedic traditions and Orphico-Pythagorean traditions. So the theory that they all have common Hyperborean origin seems justified as there are also common links in poetry, languages and genes." fascinating. Can you comment on the links between Sumerian, Egyptian and Indo-European myths. For example, most indo-european languages contain a story of a lightning/sky god that slays a serpent (Indra slaying Vritra, Zeus slaying Typhon, Perun/Veles, Thor slaying Jörmungandr). This myth is also contained in Sumerian (Marduk slaying Tiamat) and Egyptian (Set slaying Apep). Are these also connected to the hyporborean religion? "(Marduk slaying Tiamat) and Egyptian (Set slaying Apep)"
There is no proof Tiamat was a dragon till the Enuma Elish of the Kassite era. It Ra fighting Apep in the New Kingdom mythology is a whole different concept than the IE dragonslayer myth which is related to the IE concept of kingship. "Apep, also called Apophis, was the god of chaos and Ra's greatest enemy. He was said to lie just below the horizon line, trying to devour Ra as Ra descended into the underworld. As he swallowed Ra, this led to the setting of the sun and when he had completely swallowed Ra this led to nighttime. He never succeeded in completely swallowing Ra however as he eventually spits Ra back out, causing the sun to rise." So as you can see these myths only made it after some IE influence. Thanks for the feedback Rob & matt. Does it mean anything that Corded Ware's farmer ancestry is really similar to the farmer ancestry in Beaker Britain/Netherlands & Beaker Poland? Czech Beaker's farmer ancestry has that stuff in addition to almost pure Anatolian from Czech farmers similar to "Czech MN." I'm trying to G25 until someone uses better methods. The trends are real. Unetice, CWC, and Beaker all have WHG-rich farmer ancestry something like 40% WHG. “To the East went Ayus; from him descend the Kurus, Pancalas, Kasis and Videhas. West went Amavasu; from him descend the Gandharis, the Sparsus and the Arattas. I found it interesting that the Sumerians and Akkadians also called the people around the Armenian mountains as "Arattas". Also interesting is the fact that India specific mtDNA was found in Maykop culture, and Mariya Ivanova insists that they seem to have ties with Iranian Plateau and SC Asia. >"(Marduk slaying Tiamat) and Egyptian (Set slaying Apep)"
It is interesting that the same myth is found in anatolian languages too (Teshub slaying Illuyanka). clearly the myth has PIE origins, but what is strange that similar myths also appear in regions that are not Indo-European. Hyporborean invasions anyone? Not sure what's with the Hyporborean obsession here, didn't Conan tell them what's what? Not everything can be attributed to invasions. The New Kingdom Egyptians (1550-1077BCE) could have picked the myth from their Mitanni neighbors. It was most probably brought to Babylon by the Kassite horse worshippers, who most likely had Indo-Aryan elite like the Mitanni. ^ for epoch as well. "LOL. The Elbe takes you to northeast Germany, which was GAC territory." Just to clarify. The Elbe Mouth is in Northern Germany on the former West German side near Cuxhaven and Brunsbüttel not too far from Southwest Denmark. Commentator Bronze is now banned from this blog for repeatedly posting false information and not adding anything useful to the discussion. Here's the 1240k hg19 SNPs for DA101, the Tien Shan Eastern Hun from 1783 BP (uncalibrated) who died of the plague, in 23andMe format. This has 399529 of 1198444 autosomal (no Y) 1240k SNPs. There is no Y, or mtDNA in this autosomal subset. In this run there was no filter on read depth and quality scores, but I can put in any kind of filter you want, like depth, quality, and map quality. Also, I can restrict this to only those SNPs with alleles that have either the 1240 reference or alternate alleles, if that turns out to be an issue. If you need this in another format besides 23andMe like the ANCESTRYMAP .geno format, I can provide that too. I ran this sample with the K7 just to check whether it was suitable for the G25, and unfortunately it's not, because it shows too much noise. The Sub-Saharan score shouldn't be much more than 1%, so this doesn't just look like deamination noise, but some sort of reference bias. If you can ask someone how to sort this out then maybe I can then use this genome. Fair enough the Elbe mouth is not in NE Germany, but the river as a whole is in east. Even Brunsbuttel marked the western extent of GAC range. So would you agree that their neighbours in that area could have been related to Swedish Funnel Beaker people ? And could it be that trade from the Elbe Mouth could have taken some Swedish Funnelbeaker ancestry up river to an area not far from Bavaria ? Or did GAC not allow trade trough their territory ? "that the greatest number of Indo-European languages, and the greatest diversity of them is to be found, and this from the earliest recorded times"
the "earliest recorded times" is left intentionally vague .... for most European languages this means Christian Era ! Pythagoras was from Samos(just see where is on the map!). These folks thought their Santa equivalent was from northern Bulgaria. Thats their conception of extreme north. That said, it's quite possible that IE languages were present in Europe before yamnaya. here is no evidence against it or for it. There were demographically large settlements and their language is unknown. nothing of the Bavarian B.B. grave goods and import items point to Sweden , but instead the one item of northern provenance points to the Proto -Amber route to the southeast Baltic (GAC , Narva). Once again, I think their conclusions are premature considering how little we know about the western Yamnaya horizon. I do agree that we're potentially missing some key pieces---in both space AND time, 4000-2700BC in particular. Eastern France, N. Italy and S. Germany would be very much of interest. What is your theory about how L51 got introduced in Western Europe and how steppe-related DNA increased by BB times? 1240k names, but that is really up to you. So apparently there's no R1a in the ancient Indus Valley samples. No surprise. He he, ‘central asia’. Definitely not Europe, no no no no NO. Well, technically he's correct. The descendants of Steppe_MLBA entered South Asia via Central Asia, and most were probably admixed with earlier people from the Kazakh steppe and the Inner Asian Mountain Corridor (IAMC). Via Central Asia from Europe, so technically incorrect. Dr. Rai infoms ,to not take the Open Magazine interview seriously, as the interviewer unfortunately didn't understand many crucial points of what was said to him .. The very latest from Rai...hehe.